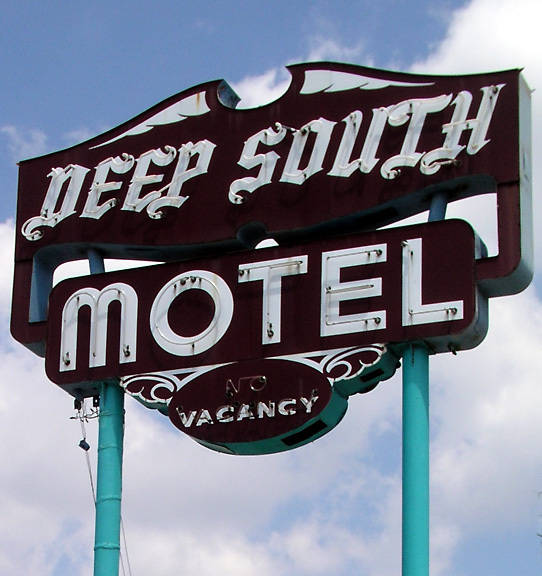 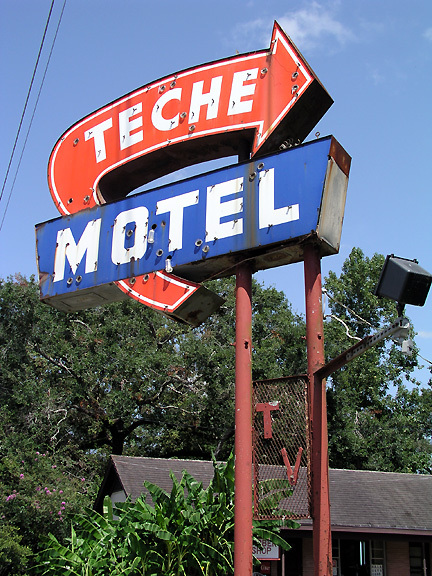 Head toward New Orleans, taking US 61, and you’ll encounter waves of postwar motels, mostly abandoned to the land of hourly rates and soggy carpets. 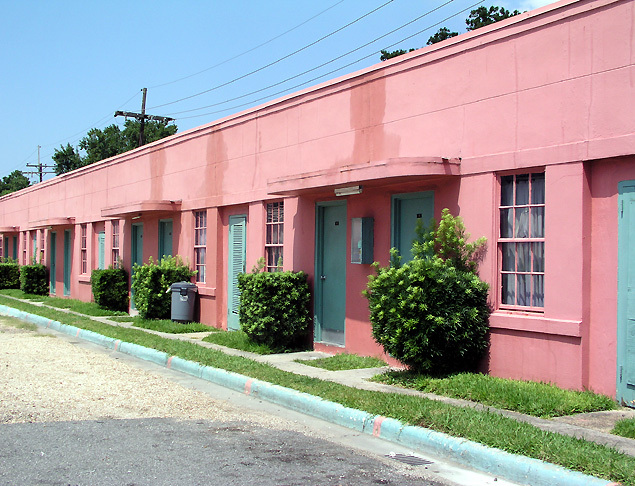 Drop by the town of Metairie to visit the Deep South Motel whose metal trellis railings could have been lifted off a more fashionable stop on Bourbon Street. 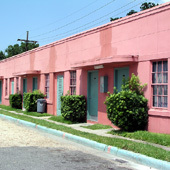 The old road, here called Airline Highway, also rolls by the Sugar Bowl Courts, a tiny square of pink sided, green-doored rooms surrounding a gravel lot. Atop the doors, 90-degree curved “eyebrows,” the type you’d find in Miami’s South Beach complete the streamlined moderne scene. 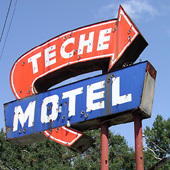 Stop for photos, but don’t plan on spending the night. 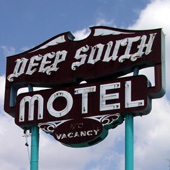 Inside the lobby, you face a two-way mirror, no sight of the desk clerk, and enjoy the opportunity to buy a condom for a buck. 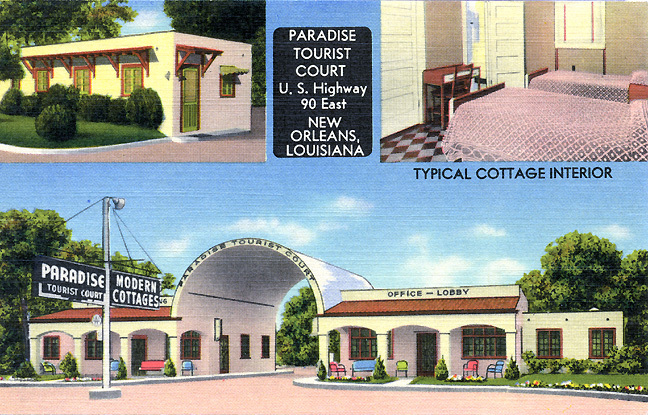 Heading toward the Big Easy, squint your eyes a bit and you may catch the ghostly images of motels long gone, including the Alto Tourist Court with its stylish portholes Paradise Tourist Court with its arched overhang that once admitted travelers to quiet bungalows.